As crosstown traffic becomes intolerable, a few Seattle thinkers are suggesting a gondola as the best way out of the mess. One possible route would go from the light-rail station being built on Capitol Hill to Olympic Sculpture Park, serving the South Lake Union, Seattle Center and Belltown areas. Another idea would run overhead cars between downtown and the central waterfront. The Capitol Hill gondola is championed by Matt Roewe, of VIA Architecture, and Matt Gangemi, better known among transit wonks as Matt the Engineer. Roewe’s trial-balloon essay about the gondola proclaims, “Rise Above it all, for real this time,” reprising the old slogan of the never-built, 14-mile Green Line monorail. Meanwhile, businessman Hal Griffith is researching another concept, with slightly more political traction, for a gondola from downtown to the central waterfront. Griffith, owner of the new giant Ferris wheel on the waterfront, has discussed generalities with some business and city leaders. He said a gondola could move visitors from parking spaces near the state convention center to the shoreline. City Councilmember Tom Rasmussen, chairman of the council’s Transportation Committee, likes the idea of helping people reach the waterfront while road and seawall construction are creating years of obstacles. “It could be successful, it could be useful,” he said. “I’m interested in following up with him. “The other attractive part is, he wants to pay for it,” Rasmussen said. Griffith, who along with his family owns Miners Landing on Pier 57, built the Seattle Great Wheel on the pier last year. Roewe may have shot himself in the foot by suggesting a gondola terminus within a soaring 400-foot-high building at the Capitol Hill light-rail station along Broadway, which he calls the cherry on top. “It would be such a huge structure, it might look like something out of ‘War of the Worlds,’ ” Rasmussen said. Still, supporters say now is the time to build, before South Lake Union becomes too full of buildings to allow room for a gondola route. 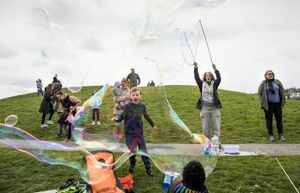 Other citizens have suggested lines up Queen Anne Hill, climbing Yesler Way, spanning the Montlake Cut, even reaching West Seattle or Ballard. A common criticism is the threat to privacy, if riders peer down through condo dwellers’ windows. The Fairmont Olympic Hotel might not appreciate a downtown skyride overhead, said Councilmember Sally Bagshaw. Aerial lines, with costs similar to streetcars, have made greater progress in Seattle’s neighbor cities. • Portland has a tram going two-thirds of a mile from the Oregon Health Sciences University Hospital to the new south waterfront area, built for $57 million and carrying 3,700 riders a day. • In Vancouver, a $120 million, 1.7-mile Burnaby Mountain Gondola is an option to replace diesel buses that climb from the nearest SkyTrain station to Simon Fraser University. “The gondola is a great idea,” said Gordon Price, director of the SFU City Program and a former Vancouver city councilor. For a long-term cost of about $10 million more than operating and replacing buses, the gondola would cut travel time by eight minutes, said a study for B.C. TransLink. Price thinks it will be built, but not in the next few years, because of other demands for money for at least three high-capacity train projects. A similar avalanche of requests for transit in Seattle means that any gondola here would be a longshot.